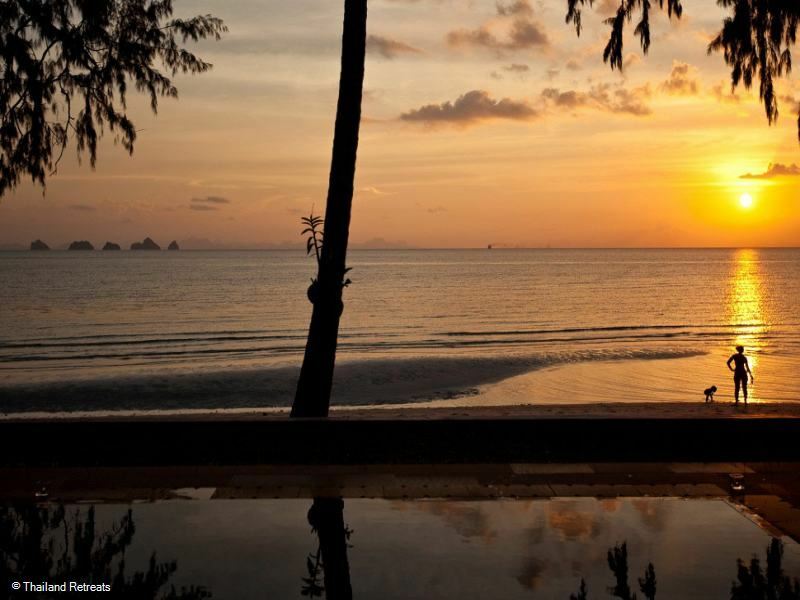 Waimarie is a superb Koh Samui luxury villa on a west coast beach with great sunset views. Family friendly with a playground, sea kayak, tennis court pool and lawned areas. 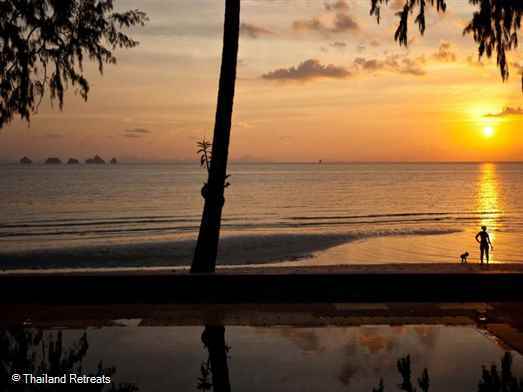 Waimarie is nestled away on the west coast of Koh Samui set on a beautiful white sand palm fringed beach. Pronounced why-mar-ee it is translated as "peaceful waters" in the language of the New Zealand Maori. This beautiful villa offers all you need and more for the ultimate get away. Situated right on the beach and with the best sunset views on the island it is the ultimate in comfort, style and beauty with a unique blend of Thai and contemporary design and furnishings. Walking into Waimarie's expansive private grounds, past the tennis court, you will enter landscaped gardens housing 3 large pavilions with six en-suite bedrooms providing luxury accommodation for up to 14 people. The three bedroom pavilions each contain two bedrooms with interconnecting doors and include 2 similar master sized bedrooms. Each of the bedrooms has its own private terrace with day bed and to ensure optimum privacy and comfort, each of the six bedrooms is air conditioned and has its own beautifully appointed en-suite indoor/outdoor bathroom set amongst tropical plants. The open plan kitchen and adjoining dining room are situated in a beach-side pavilion. Cross under the pergola to the adjacent pavilion and enter the living area comprising two separate seating areas one of which houses the villa's large plasma tv and stereo system. The living and kitchen/dining pavilions feature fully retractable doors allowing you to experience a unique blend of indoor/outdoor living. Whether lounging on the comfortable sofas or gathering in the kitchen at the stylish breakfast bar you will experience the fresh sea breeze and ocean views from wherever you are. From either of these pavilions, you step out onto the teak deck and down to the large swimming pool, which is just metres away from the white sand beach and the surrounding pool deck is furnished with ample cushioned sun loungers and parasols. Next to the pool is an impressive sala built from ancient teak wood featuring a seating area for al- fresco dining and large day beds and comfortable arm chairs for massages and relaxing. Waimarie caters particularly well for families. There is a playground area featuring a fort tower, swing, turbo slide, children's rock climbing wall as well as numerous grassy areas for ball games and general play. The property also offers a sea kayak and a range of other toys and games. 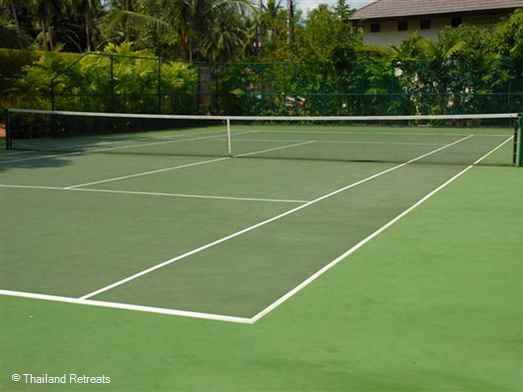 Older children and adults can enjoy the private tennis court. Should you fancy a change of scenery, arrangements can be made for boat trips to adjacent islands for fishing or snorkeling trips, elephant trekking in the hills, visits to Angthong Marine Park, or simply dining in the quaint Bophut Fishing Village, or shopping in Nathon, Chaweng or Lamai beaches. Waimarie is serviced by five resident staff including an English speaking villa manageress who will cater to your every need while the full time Thai Chef will prepare a selection of exquisite local cuisine. 1 bedroom with king size 4 poster bed adjoining.. The resident villa staff will ensure the villa is kept clean and tidy. Applies for bookings made before and stay dates to 30th June 2019. Joy and her attentive staff make this slightly dated villa into a pleasurable spot for a relaxing family vacation. Nothing is a problem for Joy whatever you need arranged. We had a great chef who catered for 1yo to 86 yo. Spent 9 nights at Waimarie, and my goodness what an experience. Read the other reviews about this property, and they are all so true. Joy and the staff made this a home away from home. Every need was catered too, and nothing was a bother. The meals, the hospitality and the accommodation was everything that one can only dream of. Joy was a dream. She arranged everything for us - transport, tickets to the muay thai boxing, tourist drive around the island, shopping, massages (and believe me we had many, and they came to the house) - and even transported two our of young people to the beach party at Nikki Beach!!! Location is great, as are the facilities on site. Would recommend Waimarie to anyone that wanted an experience in this Samui. Thank you thank you thank you to Joy and the staff. This is a spectacular villa. We've just returned from a family get together over Christmas and New Year at Waimarie and had a truly magical time. Set right on a beautiful, quiet and safe beach it was the perfect spot for the kids (we had 8 with us ranging in age from 15 to six month old twins) - adults could kick back and enjoy lovely long lunches while being able to watch the children play in the pool and beach. Even the twins were well taken care of by Joy and her team and were often whisked away and entertained leaving us to eat in much appreciated peace! The food was the best we ate on the island - and nothing was too much trouble, the chef would often whip up child-friendly pasta, 2-3 curries just for lunch - and even mush up fresh mango for the twins! On the baby note - it was the perfect villa, two proper cots were provided (not just travel cots) there was a bottle steriliser there (Joy also helped me wash-sterilise bottles which was a holiday in itself!) She also went out and bought nappies, wipes and food for them which meant I didn't have to take everything with me. And because all the living/entertaining space is on the beach front to make the most of the beautiful view the rooms are very quiet. Everyone had a brilliant time - Joy and her team gave us an amazing holiday (including a magical beach BBQ , lanterns and fireworks on NYE - worth it, even if it isn't NYE!) and I would like to say a huge thank you. Waimarie is the best family-friendly villa we've stayed at - but would also be brilliant for adults only. Oh and if you can, ask Joy to arrange a boat trip for you - they pick you up right off the beach and we all loved it. Our family and friends gathered at this amazing villa to attend the wedding nearby of our daughter. The service, accommodation, meals and the amazing staff were exceptional. We would recommend this villa to anyone who would like a relaxing, family friendly holiday with fabulous food in a peaceful environment. Thank you especially to Joy for the extra touches she did and her support when I had a fall at the wedding and ended up in the local hospital. Even with this happening, we all had a great time and are looking forward to returning to our little paradise villa!! This private villa is the total package - can not find a fault - primarily due to the Villa's onsite manager - "Joy", who just makes everything happen with effortless ease. Nothing is too much trouble. We all fell in love with Joy, and were very sad to depart. Wai Marie is ideal for small groups, up to 12 people max. We loved hanging out at the villa so much we chose not to venture our as much as we initially planned. The quality of the fresh food prepared by the chef was so unbelievably good it was pointless to head out and eat elsewhere. The 12 of us would all be back there in a heartbeat if possible. We miss Joy & Wai Marie. BOOKING TERMS For rentals beginning more than 75 days after the date of the booking request - a deposit of 20% of the total rental amount is payable For rentals beginning 75 days or less after the date of the booking request - the total rental amount is payable as a deposit Where a 20% deposit applies to the booking, the Guest must pay the remaining 80% balance not less than 75 days before the scheduled arrival date. CANCELLATION TERMS 20% of the total rental amount will be forfeited if the cancellation is made more than 60 days before the start of the rental period. 50% of the total rental amount will be forfeited if the cancellation is made between 30 and 60 days before the start of the rental period 100% of the total rental amount will be forfeited if the cancellation is made between 1 and 29 days before the start of the rental period.